It’s no secret that the NFL captivates millions of fans each year, and the Madden franchise has always been there at the forefront, leading the pack on the videogame side of the football world. 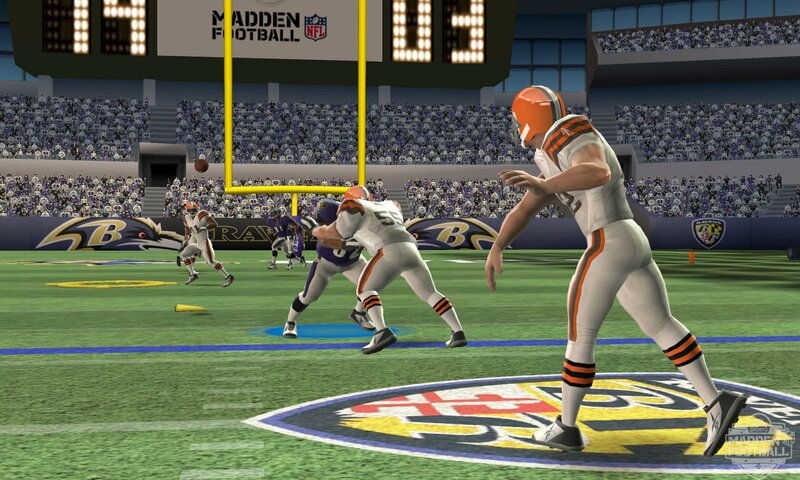 Even though it’s currently in the off-season for the NFL, it’s not stopping EA from charging onto the 3DS scene and putting a new 3D spin on the Madden franchise. It’s time to get dirty, so come with us as we put Madden NFL Football through intense training to find out if it’s worthy of its NFL license, or if it still needs some time on the practice field. Madden has been a long-running franchise on home consoles and portable systems alike, but the series has always truly shined the most in the home. 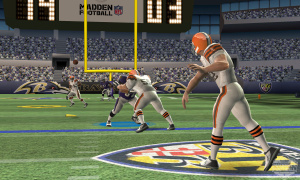 Previous Madden titles on DS systems have been buggy affairs that offer less-than-stellar gameplay and graphics, and just simply fail to impress. Welcome the new Nintendo 3DS to the market, and we finally have the chance to experience a portable version of Madden that can stand on the same playing field as it’s brethren on Wii. 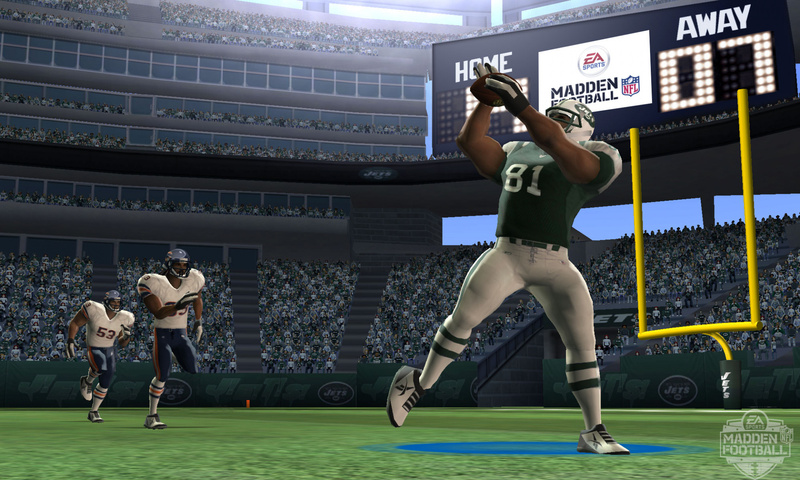 Madden NFL Football offers up a Play Now mode for jumping into a quick match of pigskin action that can either be played in the standard 11 on 11 NFL regulation football, or 5 on 5 arcade styled games. Both of these options also carry over into the Season mode as well, where a team can be taken through the ranks and take a shot at becoming the Super Bowl Champions. A Practice mode is also available to hone in those perfect passing plays, but outside of these few modes there is little else to do here — there's no franchise mode or any form of multiplayer. 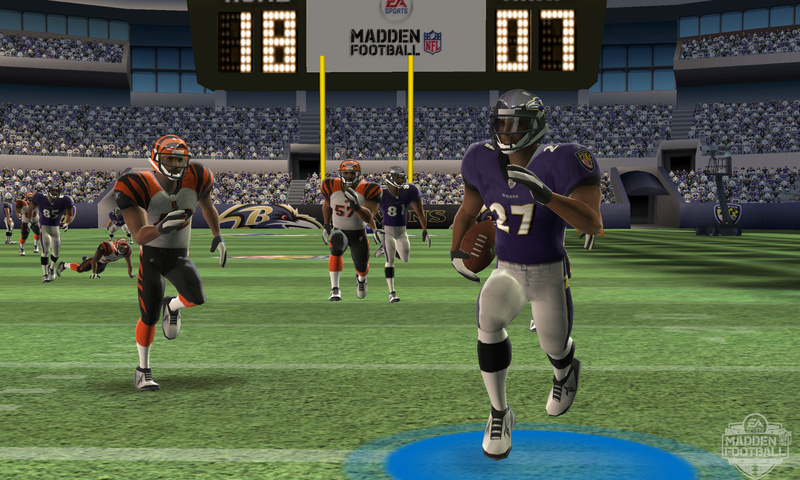 The Arcade mode eliminates the play clock and first-downs, and reaching a set score first wins the game. It’s a fun distraction from the standard football game, but sadly it’s just isn’t more than just that. While the number of modes may be lacking, it does offer up a solid portable game of football. 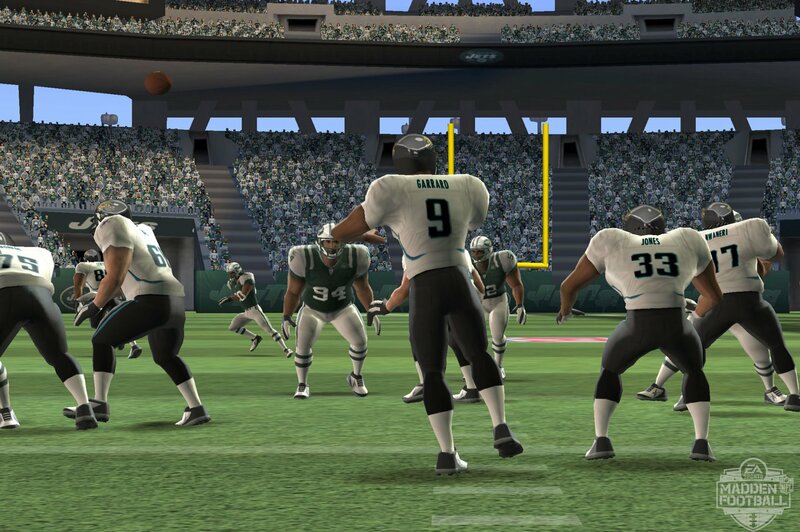 Plenty of character animations and tight controls make the players move realistically, creating the feel of a Madden game that we would experience on Wii instead of a portable system. The Circle Pad offers precision input for running those tight lines through the defence, and the touchscreen allows the ability to draw custom receiver routes, essentially allowing you to create your own plays. The GameFlow system has also been included, where the game automatically selects the plays for the player, and is a great addition for this portable iteration as it shortens the length of a game and keeps the action constantly flowing. GameFlow is perfect for newcomers to the series, but the core fans may find it unnecessary, preferring the deep playbooks that the series is known for. The standard settings had us winning most games by significant margins, so veterans of the series will likely want to turn up the difficulty upon starting. While the game isn’t overly impressive in the graphics department, the 3D effects are handled quite well. The camera zooms in on the ball carrier when in possession to pull out the 3D effect, and when passing the ball the added layer of depth actually helps for pulling off those pinpoint precision passes. When big plays are made and the replay mode kicks in, these replays usually utilise great camera angles to show off the 3D effects effectively. The only spot that the 3D isn’t used effectively is in a few of the game's menus, where it’s quite obvious that the developers tried to make a cool 3D effect where the screen pans forward toward the gamer, but instead it looks like a blurry mess, even when holding the system perfectly in the “sweet spot”. Overall the 3D is an effective new element to the series, and one that we look forward to seeing utilised more in future sports titles on 3DS. We said we were putting the game through intense training, and now the time has come to see where it fumbles. The game is lacking in modes of play, but the worst part is the fact that even in the season mode there is no way to track the season’s stats. It’s bad enough that the franchise mode isn’t available, but individual stat tracking for the season mode is unacceptable in this day and age, and just one save slot for a season is disappointing too. This means that if a standard 11 on 11 season is on-going, a 5 on 5 arcade season can’t be started until the previous one is completely finished. A simple second save slot is all it would take to correct this situation, but it’s nowhere to be found. The in-game commentary is actually quite impressive overall, calling plays effectively and adding a layer of excitement to the ballgames. The problem here is that outside of the quarterback, no other names will be heard from the commentators, which strips the teams of their personality completely. It’s almost like going back in time to the Super NES days when the commentary was barebones and stat-tracking was done by pen and paper, and once again it’s just unacceptable here. Throughout our playtime in both season modes there wasn’t one change of weather or time of day, which is something that was available back in the SNES days, and again should be here too. Another annoying flaw is that when making a big play that receives a replay, the replay camera would sometimes completely ignore whatever spectacular action happened to force the replay. It’s quite obvious that the game is a rushed job to get to shelves in time for the 3DS launch, and the quality suffers for it. After multiple seasons played, and being crowned Super Bowl Champions, we sit on the side-lines tired and disappointed. The core gameplay is fundamentally solid and filled with potential, but it seems like the developers gave up at halftime instead of pushing through to the end. The end result is a featureless title that feels like a demo of things to come instead of a full $40 retail release, and the lack of multiplayer is a glaring oversight. 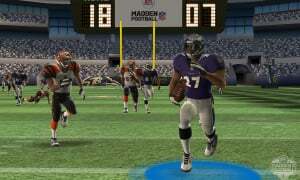 Hopefully EA will take it back onto the practice field, and come back later this year with a fully featured Madden 12 for 3DS that fulfils the potential that they started here. Nintendo holding back on its first party heavy hitters really shows how bad the majority of third party Nintendo console games are. Also, I'll say it again, as if it matters, no franchise mode. It almost seems that the 3DS is getting a bunch of weak launch titles, but I bet it'll pick up steam before too long, just like the PS3. Hey all you British! Wanna play a game of "football"? "Hopefully EA will take it back onto the practice field, and come back later this year with a fully featured Madden 12 for 3DS that fulfils the potential that they started here." They already said they wouldn't make one. As for the game, I just got it yesterday (Along with Pilotwings) at Toys R us, and I love it! I don't really care that it doesn't have multiplayer or online, I just wanna play football. This was one of my launch buys, and I thought it would be great. Eh, I like it, but it would REALLY benefit from online/multiplayer. The basic game is solid, but it is a pretty bare-bones title. I have Madden titles for my original X-Box that are much deeper. The basic gameplay is decent, and the circle pad is a heck of a lot better than a + pad for football. It may be the best football game on the Wii or DS series, but that is not saying too much. What I do like is having a football game to play at the local pub while meeting friends - it has a bit more "street cred" than being some weird dude having a beer and playing Nintendogs when I'm first to arrive. Much better to be a weird dude playing football. I just wish we could play against each other over a few pints instead of shutting the game down when my friends arrive. I wouldn't have thought it would be available in the uk, being it is American football. Wait, this isn't football at all. Damn you Americanisation of the English language! It isn't any better on the Wii either. Never got into this franchise...seems like a good decision now. Thanks Chris! @626b @MadScientistMan - I liked it best when you Brits called it Grid Iron. That was the dopest. If only I knew anything about football I might understand the tagline joke. I've been wishing in vain for years that someone would step up and completely rethink video-game football, to finally end the staleness of the Madden formula, but I suppose it will never happen. 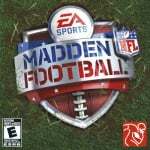 I love football strategy and have a classic board game that pits two players against each other in sophisticated playcalling... but I just can't get into the Madden style of game, which is okay at simulating the skills of a quarterback (recognize the coverage / situation and make the play) but does little for the remainder of the game. Even though it probably wouldn't sell, I'd love to see football in the form of a turn-based game in which you make adjustments to every player on the field as the play unfolds across several stages. Or something, anything other than the Madden quick-QB style of picking a chart and making the pass. This one didn't look too bad. I was wrong. I'm Dutch, but I always try to speak British English instead of American English (It's Sonic Colours! ). We Dutch usually call this Madden Stuff either American Football of Rugby. And what the Americans call soccer is football. @wariowoods That would be sweet, a turn-based strategy football game where each down plays out depending on your choices. I'd buy that. @626b Rugby?! What do you call Rugby then? I can see EA's next rant now: Our games don't sell well on the 3DS because of Nintendo. @Odnetnin... The quaterback calls Down, Set, Hut to get the ball snapped to him, but in this case, it's obviously a fumble. I was thinking about picking up some games, but I think I'll hold off. I've never been any good at video game football simulators (despite actually playing for a little while in high school) The plays are just confusing. I think continuous play sports like hokey or soccer of basketball work much better. I've never bought a football video game, and this will be no exception. That's a pretty good score for an EA the past couple of years. 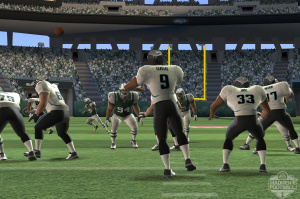 STILL playing Madden 2004 waiting for them to upgrade the game. @StarDust... I can't wait for a NHL game in 3D on 3DS! Well, there's always Bloodbowl, but that title is super niche (and not available on Nintendo platforms). Anyway, I don't think I've ever played a quality sports title on a handheld so I can't say I'm terribly surprised that this one isn't anything special.